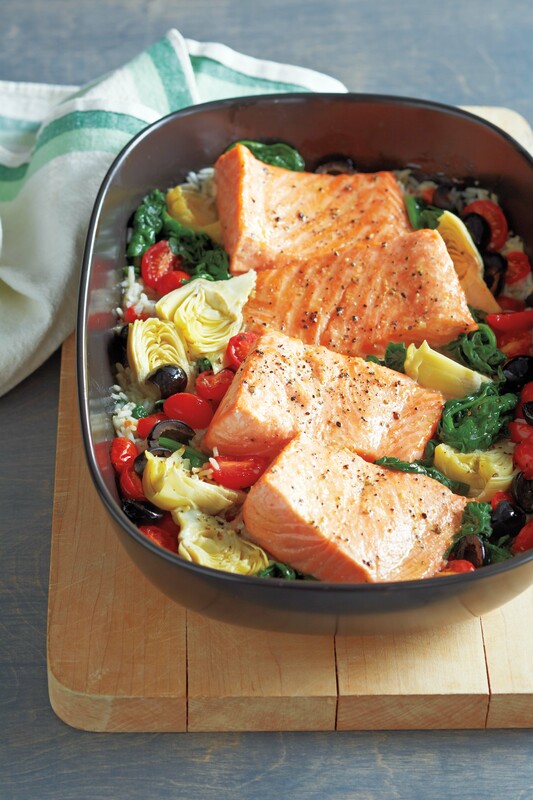 How good does this one-pot roasted salmon, rice, and vegetable dish look? Amazing, wouldn’t you agree? This is my kind of meal — easy, healthy, and delicious. No one knows gluten-free cooking and baking better than Carol Fenster. This post is about her newly revised and updated cookbook, Gluten-Free 101: The Essential Beginner’s Guide to Easy Gluten-Free Cooking. It’s also your opportunity to win your own copy. But first, I must disclose that Carol is a good friend of mine. We have lunch together often and we’re never at a loss for words. In fact, three hour lunches are common for us. Aside from being the visionary in the world of gluten-free cooking, she’s an incredibly nice person — one of the nicest people you’d ever want to meet. For someone who’s known world-wide for her expertise, she’s over-the-top humble and remarkably generous with her knowledge. All she wants to do is help people navigate the gluten-free lifestyle in a healthy and delicious way. Carol’s been doing this long before it was trendy. In fact, she’s been creating gluten-free recipes, writing cookbooks (10 to date), sharing information, and increasing awareness of celiac disease and gluten sensitivity for over 25 years. She’s the ultimate expert. Having said that, there’s a touch of newsworthy irony to Carol’s story. She grew up on a wheat farm in Nebraska and went on to marry a wheat farmer. Imagine how life-altering it was for her to be diagnosed with an intolerance to gluten? Her family’s livelihood was defined by wheat. It was the main topic of conversation during family gatherings. Her journey from wheat farmer’s daughter to the queen of gluten-free cooking hasn’t been easy. But Carol has a delightful sense of humor, a supportive family, and an unwavering spirit, so that part of the story is just a tasty footnote to her success. Now, back to the features of Gluten-Free 101. This book is designed for people new to the gluten-free lifestyle, but there’s enough interesting information for even the most experienced cook. The book describes how to read labels, offers alternatives to gluten, gives substitutions, and details how to successfully stock a gluten-free pantry. The book also highlights 175 gluten-free recipes, including everything from basic quick bread to ham quiche to lemon bars. It’s all there, whether you’re new at this or a seasoned gluten-free expert. The gorgeous color photos (see salmon photo above) also make it a fun book to drool over. Who wants to win their own copy? Trust me, it’s worth a try. Here’s all you have to do to be entered. Choose to do one of the following (or all) and then leave me a message here on my blog as to what you did or why you’d like to have this cookbook. I’ll choose a winner at random. The contest closes at midnight on Sunday, February 16th. Make sure you leave me a message in the comment section so I know who is entered and how to get in touch with you if you win (your email address will remain private). Good luck! Place a rack in the lower third of the oven. Preheat the oven to 400°F. Place the boiling broth and the rice in a deep, 2-quart baking dish. In a large bowl, toss the spinach, artichokes, and garlic together and place on top of the rice. Arrange the tomatoes and black olives around the edges of the dish. Arrange the salmon fillets on top of the spinach, drizzle with the olive oil and wine, and sprinkle with the salt, pepper, and lemon pepper seasoning. Cover tightly with a lid or aluminum foil. Roast in the oven for 30 minutes. Remove the lid and continue roasting until the fish flakes easily with a fork, 5 to 7 minutes, depending on the thickness of the fish. Serve immediately. Enjoy! 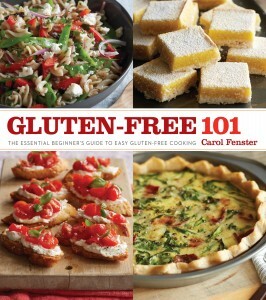 Don’t forget to leave me a comment so you’re entered to win a copy of Gluten-Free 101. UPDATE: And the winner is — Nicole (#8 comment). This entry was posted on Wednesday, February 12th, 2014 at 9:30 am	and is filed under Celiac & Gluten Intolerance, Gluten-Free Recipes. You can follow any responses to this entry through the RSS 2.0 feed. You can leave a response, or trackback from your own site. I really need some more ideas so this cookbook would be a blessing for me. Have been gluten free for 7 months now. Thank you for this opportunity. I did like on FB and pinterest. I don’t tweet. Love the recipe you included and look forward to her book. I have one of her books. I just started following Carol on Twitter. Thank you for the opportunity to win a copy of the book. My teenage daughter was diagnosed with DH last year and we’re always looking for new ideas for delicious food and substitutions for favorites. That salmon recipe looks delicious. I will have to try it with my gluten free family. Oh, YES! Looks delicious! Can’t wait to try the free recipe. I am looking forward to seeing what the cookbook has to offer. I am not new to gluten free, but I have never thought of making a recipe like this. I generally start with vegetables, add rice or potatoes, and sometimes meat. All separate. This will be a new adventure! I follow Carol on Twitter. I would love to win this book for my mother, who recently went gluten free. Nicole — you’re the winner! Congratulations. I’ll get in touch with you so we can send you a copy of Carol’s new book. Yeah! Thanks for the great recipe! I didn’t realize you could cook all his in one pot. I look forward to giving it a try. I would love some new gluten free ideas to serve to my Gluten free guests! Would love to have this book!! This book looks awesome! A must-have! I followed on Facebook, Pintrest, and twitter. We are approximately 6 months into our gluten free journey. I’m getting pretty good at cooking GF, but always love to try new ways and recipes. Gluten Free 101 sounds perfect for me. I did all three! Although the Facebook link was a friend request, not a like link. My entire family of five has gluten issues: one autism, one celiac, one allergic, and two sensitivity. I’m desperate to feed this bunch and I really need this cookbook to help me. Lemon bars are my husband’s favorite! I’d like to win a copy. Being a celiac patient, im looking for quick recipes to fix on busy week nights,to vary up my gf menu. My daughter is gluten intolerant and a comprehensive book with information and recipes would be so helpful! I’m following on FB and Pinterest! I’d love to win a copy…I’m celiac and love great recipes! I am following Carol on Twitter. The reason I would like a copy of the book is because I am newly diagnosed, and don’t really even know where to start on this journey. I’m making this tonight for Craig, but I have to try it with scallops because that’s what I defrosted. I will just add them in a little bit after everything else so they don’t overcook. I am always on the search for new recipes to keep me going forward on my gluten-free life. I would love to have the insights and recipes from this former wheat farmer, wonderful human being! I am now following her on Pinterest. Thanks for a great giveaway. I just followed your Pinterest page. Hope to be the luck winner and start this new daunting yet exciting Gluten-free life. Entering to win “Gluten-Free 101 (Recipe and Giveaway)” Appreciate all the information and products this site offers. Learning gluten free. I’d like to win this cookbook to get new ideas for gf dishes.